Clear waters, healthy coral and plentiful fish, the Surin Islands are perfect for the beginner and experienced snorkeler The Surin Islands National Park is known for the pristine reefs, lush jungles and remote location on the edge of the Andaman Sea. For getting away - and enjoying it the Surin Islands are among the very best you will find in Thailand.There are 5 Surin Islands - all uninhabited except for a small Sea Gypsy (also known as "Moken") village and the park Rangers. The remote location has preserved this tropical paradise. Located about 90 km Northwest of Khao Lak and 40 km west of Kuraburi, the Surin Islands are remote. It is best to stay in Khao Lak as Kuraburi has very little in the way of tourists infrastructure.The Surin Islands can be visited on a one day trip, or camping trips. There are no resorts on the islands only a couple of bungalows and a few tents owned and operated by the government. You will find the very best snorkelling in Thailand. Dozens of reefs, big and small litter the coastline pf the Surin Islands. The very best spots are on the Eastern coast of the two largest islands. Here you can find colorful reefs teeming with marine life. The area has been under the careful guidance of the marine biology department of one of Thailand's major universities - and you can tell! As the Surin Islands have beautiful beaches and lush soft and hard corals you will find treasures right in front of you. The corals begin at the low tide mark and the slope gently away until about 10 meters when the slope becomes steeper and they drop to the sandy bottom at 20-30 Meters. The mix of corals is incredible with lush soft corals swaying in the current, surrounded by the aptly named Staghorn, Brain, Table and Whip Corals. 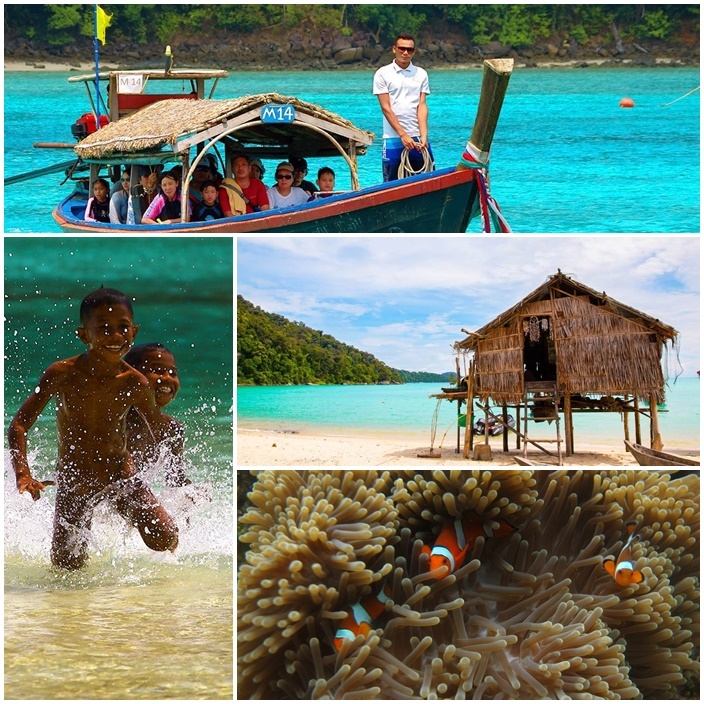 One of the major attractions of the Surin Islands is snorkelling. This is because in many places the reefs have grown right up to just 1 metre or so below the water's surface, bringing the marine life that much closer to the snorkeller. This is particularly so at Koh Torinla in the south and Koh Chi in the north. Here the reefs are very healthy and black tip reef sharks, conspicuous only by their absence from the Similan Islands, are regular visitors. The coral reef isn't all to see! Many larger marine species come in to feed, or have children and to hide from even bigger fish. While snorkeling the Surin Islands you have a great chance to see Turtles, Rays, Snappers and many other fish will come by. While we do see Manta Rays, they don't often come in to the shallows. If you get the opportunity to take a walk through the forests then watch out for crab-eating macaques, flying lemurs and flying foxes, as well as deer and squirrels. Bird watchers can enjoy sightings of hornbills, Nicobar pigeons, collared kingfishers, drongos and babblers, as well as birds of prey such as sea-eagles and kites. Turtles still follow an age-old ritual to come ashore here and lay their eggs. The hatchlings enter the Andaman Sea and swim as far as the Nicobar Islands and the east coast of the Malay Peninsula. How to travel to the Surin Islands? The best way to travel here is to book a tour package from our company. The reason for this is that for half of the year there are no public boats operating to the Islands. We suggest for access and value for money you book yourself or a group onto one of our speed-boat packages. As ever the larger the group the better the value for money as well as a personalized tour to suit your groups needs. For those interested we also offer private speed-boat charters.